Yesterday during the latest Nintendo Direct we found out Minecraft would be released exclusively on the New Nintendo 3DS. Since then, it has been clarified the closet equivalent to Minecraft: New Nintendo 3DS Edition is the 0.15.4 build of Minecraft: Pocket Edition. With plans to bring a local multiplayer component to the New 3DS version of the game, how far will the updates go? 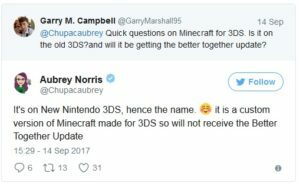 Aubrey Norris who is part of the Minecraft team recently replied to a fan on Twitter regarding a question about the upcoming “Better Together Update” which will unify the Windows 10, mobile and console editions of Minecraft – including the Nintendo Switch version. While the New 3DS version may miss out on social unification, it’s still impressive how the team at Other Ocean Interactive – who are behind this 3DS adaptation – have managed to provide world sizes that are 2016 x 2016 and 128 blocks high. These dimensions exceed the sizes of the maps in the Wii U version of the game. Not bad for hardware based on a device originally released in 2011. Let us know in the comments if you have bought Minecraft on New 3DS yet and what your thoughts are about it are so far.